After a year of bloodshed, the crisis in Syria has reached a decisive moment. It is estimated that more than 7,500 lives have been lost. The United Nations has declared that Syrian security forces are guilty of crimes against humanity, including the indiscriminate shelling of civilians, the execution of defectors, and the widespread torture of prisoners. Bashar Al-Assad is now doing to Homs what his father did to Hama. Aerial photographs procured by Human Rights Watch show a city that has been laid to waste by Assad’s tanks and artillery. A British photographer who was wounded and evacuated from the city described it as “a medieval siege and slaughter.” The kinds of mass atrocities that NATO intervened in Libya to prevent in Benghazi are now a reality in Homs. Indeed, Syria today is the scene of some of the worst state-sponsored violence since Milosevic’s war crimes in the Balkans, or Russia’s annihilation of the Chechen city of Grozny. What is all the more astonishing is that Assad’s killing spree has continued despite severe and escalating international pressure against him. His regime is almost completely isolated. It has been expelled from the Arab League, rebuked by the United Nations General Assembly, excoriated by the U.N. Human Rights Council, and abandoned by nearly every country that once maintained diplomatic relations with it. At the same time, Assad’s regime is facing a punishing array of economic sanctions by the United States, the European Union, the Arab League, and others—measures that have targeted the assets of Assad and his henchmen, cut off the Central Bank and other financial institutions, grounded Syria’s cargo flights, and restricted the regime’s ability to sell oil. This has been an impressive international effort, and the Administration deserves a lot of credit for helping to orchestrate it. The problem is, the bloodletting continues. Despite a year’s worth of diplomacy backed by sanctions, Assad and his top lieutenants show no signs of giving up and taking the path into foreign exile. To the contrary, they appear to be accelerating their fight to the finish. And they are doing so with the shameless support of foreign governments, especially in Russia, China, and Iran. A steady supply of weapons, ammunition, and other assistance is flowing to Assad from Moscow and Tehran, and as The Washington Post reported yesterday, Iranian military and intelligence operatives are likely active in Syria, helping to direct and sharpen the regime’s brutality. The Security Council is totally shut down as an avenue for increased pressure, and the recently convened Friends of Syria contact group, while a good step in principle, produced mostly rhetoric but precious little action when it met last month in Tunisia. Unfortunately, with each passing day, the international response to Assad’s atrocities is being overtaken by events on the ground in Syria. Some countries are finally beginning to acknowledge this reality, as well as its implications. Saudi Arabia and Qatar are calling for arming opposition forces in Syria. The newly-elected Kuwaiti parliament has called on their government to do the same. Last week, the Supreme Allied Commander of NATO, Admiral James Stavridis, testified to the Senate Armed Services Committee that providing arms to opposition forces in Syria could help them shift the balance of power against Assad. Most importantly, Syrians themselves are increasingly calling for international military involvement. The opposition Syrian National Council recently announced that it is establishing a military bureau to channel weapons and other assistance to the Free Syrian Army and armed groups inside the country. Other members of the Council are demanding a more robust intervention. To be sure, there are legitimate questions about the efficacy of military options in Syria, and equally legitimate concerns about their risks and uncertainties. It is understandable that the Administration is reluctant to move beyond diplomacy and sanctions. Unfortunately, this policy is increasingly disconnected from the dire conditions on the ground in Syria, which has become a full-blown state of armed conflict. In the face of this new reality, the Administration’s approach to Syria is starting to look more like a hope than a strategy. So, too, does their continued insistence that Assad’s fall is “inevitable.” Tell that to the people of Homs. Tell that to the people of Idlib, or Hama, or the other cities that Assad’s forces are now moving against. Nothing in this world is pre-determined. And claims about the inevitability of events can often be a convenient way to abdicate responsibility. But even if we do assume that Assad will ultimately fall, that may still take a really long time. In recent testimony to the Senate Armed Services Committee, the Director of National Intelligence, James Clapper, said that if the status quo persists, Assad could hang on for months, possibly longer. And that was before Homs fell. So just to be clear: Even under the best-case scenario for the current policy, the cost of success will likely be months of continued bloodshed and thousands of additional lives lost. Is this morally acceptable to us? I believe it should not be. In addition to the moral and humanitarian interests at stake in Syria, what is just as compelling, if not more so, are the strategic and geopolitical interests. Put simply, the United States has a clear national security interest in stopping the violence in Syria and forcing Assad to leave power. In this way, Syria is very different than Libya: The stakes are far higher, both for America and some of our closest allies. This regime in Syria serves as the main forward operating base of the Iranian regime in the heart of the Arab world. It has supported Palestinian terrorist groups and funneled arms of all kinds, including tens of thousands of rockets, to Hezbollah in Lebanon. It remains a committed enemy of Israel. It has large stockpiles of chemical weapons and materials and has sought to develop a nuclear weapons capability. It was the primary gateway for the countless foreign fighters who infiltrated into Iraq and killed our troops. Assad and his lieutenants have the blood of hundreds of Americans on their hands. Many in Washington fear that what comes after Assad might be worse. How could it be any worse than this? The end of the Assad regime would sever Hezbollah’s lifeline to Iran, eliminate a long-standing threat to Israel, bolster Lebanon’s sovereignty and independence, and inflict a strategic defeat on the Iranian regime. It would be a geopolitical success of the first order. More than all of the compelling moral and humanitarian reasons, this is why Assad cannot be allowed to succeed and remain in power: We have a clear national security interest in his defeat. And that alone should incline us to tolerate a large degree of risk in order to see that this goal is achieved. Increasingly, the question for U.S. policy is not whether foreign forces will intervene militarily in Syria. We can be confident that Syria’s neighbors will do so eventually, if they have not already. Some kind of intervention will happen, with us or without us. So the real question for U.S. policy is whether we will participate in this next phase of the conflict in Syria, and thereby increase our ability to shape an outcome that is beneficial to the Syrian people, and to us. I believe we must. The President has characterized the prevention of mass atrocities as, quote, “a core national security interest.” He has made it the objective of the United States that the killing in Syria must stop, and that Assad must go. He has committed the prestige and credibility of our nation to that goal, and it is the right goal. However, it is not clear that the present policy can succeed. If Assad manages to cling to power—or even if he manages to sustain his slaughter for months to come, with all of the human and geopolitical costs that entails—it would be a strategic and moral defeat for the United States. We cannot, we must not, allow this to happen. For this reason, the time has come for a new policy. As we continue to isolate Assad diplomatically and economically, we should work with our closest friends and allies to support opposition groups inside Syria, both political and military, to help them organize themselves into a more cohesive and effective force that can put an end to the bloodshed and force Assad and his loyalists to leave power. Rather than closing off the prospects for some kind of a negotiated transition that is acceptable to the Syrian opposition, foreign military intervention is now the necessary factor to reinforce this option. Assad needs to know that he will not win. What opposition groups in Syria need most urgently is relief from Assad’s tank and artillery sieges in the many cities that are still contested. Homs is lost for now, but Idlib, and Hama, and Qusayr, and Deraa, and other cities in Syria could still be saved. But time is running out. Assad’s forces are on the march. Providing military assistance to the Free Syrian Army and other opposition groups is necessary, but at this late hour, that alone will not be sufficient to stop the slaughter and save innocent lives. The only realistic way to do so is with foreign airpower. Therefore, at the request of the Syrian National Council, the Free Syrian Army, and Local Coordinating Committees inside the country, the United States should lead an international effort to protect key population centers in Syria, especially in the north, through airstrikes on Assad’s forces. To be clear: This will require the United States to suppress enemy air defenses in at least part of the country. The ultimate goal of airstrikes should be to establish and defend safe havens in Syria, especially in the north, in which opposition forces can organize and plan their political and military activities against Assad. These safe havens could serve as platforms for the delivery of humanitarian and military assistance—including weapons and ammunition, body armor and other personal protective equipment, tactical intelligence, secure communications equipment, food and water, and medical supplies. These safe havens could also help the Free Syrian Army and other armed groups in Syria to train and organize themselves into more cohesive and effective military forces, likely with the assistance of foreign partners. The benefit for the United States in helping to lead this effort directly is that it would allow us to better empower those Syrian groups that share our interests—those groups that reject Al Qaeda and the Iranian regime, and commit to the goal of an inclusive democratic transition, as called for by the Syrian National Council. If we stand on the sidelines, others will try to pick winners, and this will not always be to our liking or in our interest. This does that mean the United States should go it alone. We should not. We should seek the active involvement of key Arab partners such as Saudi Arabia, U.A.E., Jordan, and Qatar—and willing allies in the E.U. and NATO, the most important of which in this case is Turkey. There will be no U.N. Security Council mandate for such an operation. Russia and China took that option off the table long ago. But let’s not forget: NATO took military action to save Kosovo in 1999 without formal U.N. authorization. There is no reason why the Arab League, or NATO, or a leading coalition within the Friends of Syria contact group, or all of them speaking in unison, could not provide a similar international mandate for military measures to save Syria today. Could such a mandate be gotten? I believe it could be. Foreign capitals across the world are looking to the United States to lead, especially now that the situation in Syria has become an armed conflict. But what they see is an Administration still hedging its bets—on the one hand, insisting that Assad’s fall is inevitable, but on the other, unwilling even to threaten more assertive actions that could make it so. The rhetoric out of NATO has been much more self-defeating. Far from making it clear to Assad that all options are on the table, key alliance leaders are going out of their way to publicly take options off the table. Last week, the Secretary General of NATO, Anders Fogh Rasmussen, said that the alliance has not even discussed the possibility of NATO action in Syria—saying, quote, “I don’t envision such a role for the alliance.” The following day, the Supreme Allied Commander, Admiral James Stavridis, testified to the Senate Armed Services Committee that NATO has done no contingency planning—none—for potential military operations in Syria. That is not how NATO approached Bosnia. Or Kosovo. Or Libya. Is it now the policy of NATO—or the United States, for that matter—to tell the perpetrators of mass atrocities, in Syria or elsewhere, that they can go on killing innocent civilians by the hundreds or thousands, and the greatest alliance in history will not even bother to conduct any planning about how we might stop them? Is that NATO’s policy now? Is that our policy? Because that is the practical effect of this kind of rhetoric. It gives Assad and his foreign allies a green light for greater brutality. Not surprisingly, many countries, especially Syria’s neighbors, are also hedging their bets on the outcome in Syria. They think Assad will go, but they are not yet prepared to put all of their chips on that bet—even less so now that Assad’s forces have broken Homs and seem to be gaining momentum. There is only one nation that can alter this dynamic, and that is us. The President must state unequivocally that under no circumstances will Assad be allowed to finish what he has started, that there is no future in which Assad and his lieutenants will remain in control of Syria, and that the United States is prepared to use the full weight of our airpower to make it so. It is only when we have clearly and completely committed ourselves that we can expect other countries to do the same. Only then would we see what is really possible in winning international support to stop the killing in Syria. Are there dangers, and risks, and uncertainties in this approach? Absolutely. There are no ideal options in Syria. All of them contain significant risk. Many people will be quick to raise concerns about the course of action I am proposing. Many of these concerns have merit, but none so much that they should keep us from acting. For example, we continue to hear it said that we should not assist the opposition in Syria militarily because we don’t know who these people are. Secretary of State Hillary Clinton repeated this argument just last week, adding that we could end up helping Al Qaeda or Hamas. It is possible the Administration does not know much about the armed opposition in Syria, but how much effort have they really made to find out—to meet and engage these people directly? Not much, it appears. The regime and its supporters describe the opposition, especially the armed opposition, as Salafis, Jihadists, Muslim Brotherhood supporters, al-Qaeda and terrorists. This is not true, but it’s worth noting that all the fighters I met … were Sunni Muslims, and most were pious. They fight for a multitude of reasons: for their friends, for their neighborhoods, for their villages, for their province, for revenge, for self-defense, for dignity, for their brethren in other parts of the country who are also fighting. They do not read religious literature or listen to sermons. Their views on Islam are consistent with the general attitudes of Syrian Sunni society, which is conservative and religious. Because there are many small groups in the armed opposition, it is difficult to describe their ideology in general terms. The Salafi and Muslim Brotherhood ideologies are not important in Syria and do not play a significant role in the revolution. But most Syrian Sunnis taking part in the uprising are themselves devout. He could just as well have been describing average citizens in Egypt, or Libya, or Tunisia, or other nations in the region. So we should be a little more careful before we embrace the Assad regime’s propaganda about the opposition in Syria. We certainly should not let these misconceptions cause us to keep the armed resistance in Syria at arms length, because that is just self-defeating. And I can assure you that Al Qaeda is not pursuing the same policy. They are eager to try to hijack the Syrian revolution, just as they have tried to hijack the Arab Spring movements in Egypt, and Tunisia, and Libya, and elsewhere. They are trying, but so far, they are failing. The people of these countries are broadly rejecting everything Al Qaeda stands for. They are not eager to trade secular tyranny for theocratic tyranny. The other reason Al Qaeda is failing in Tunisia, and Egypt, and Libya is because the community of nations, especially the United States, has supported them. We are giving them a better alternative. The surest way for Al Qaeda to gain a foothold in Syria is for us to turn our backs on those brave Syrians who are fighting to defend themselves. After all, Sunni Iraqis were willing to ally with Al Qaeda when they felt desperate enough. But when America gave them a better alternative, they turned their guns on Al Qaeda. Why should it be different in Syria? Another objection to providing military assistance to the Syrian opposition is that the conflict has become a sectarian civil war, and our intervention would enable the Sunni majority to take a bloody and indiscriminate revenge against the Alawite minority. This is a serious and legitimate concern, and it is only growing worse the longer the conflict goes on. As we saw in Iraq, or Lebanon before it, time favors the hard-liners in a conflict like this. The suffering of Sunnis at the hands of Assad only stokes the temptation for revenge, which in turn only deepens fears among the Alawites, and strengthens their incentive to keep fighting. For this reason alone, it is all the more compelling to find a way to end the bloodshed as soon as possible. Furthermore, the risks of sectarian conflict will exist in Syria whether we get more involved or not. And we will at least have some ability to try to mitigate these risks if we work to assist the armed opposition now. That will at least help us to know them better, and to establish some trust and exercise some influence with them, because we took their side when they needed it most. We should not overstate the potential influence we could gain with opposition groups inside Syria, but it will only diminish the longer we wait to offer them meaningful support. And what we can say for certain is that we will have no influence whatsoever with these people if they feel we abandoned them. This is a real moral dilemma, but we cannot allow the opposition in Syria to be crushed at present while we worry about the future. We also hear it said, including by the Administration, that we should not contribute to the militarization of the conflict. If only Russia and Iran shared that sentiment. Instead, they are shamelessly fueling Assad’s killing machine. We need to deal with reality as it is, not as we wish it to be—and the reality in Syria today is largely a one-sided fight where the aggressors are not lacking for military means and zeal. Indeed, Assad appears to be fully committed to crushing the opposition at all costs. Iran and Russia appear to be fully committed to helping him do it. The many Syrians who have taken up arms to defend themselves and their communities appear to be fully committed to acquiring the necessary weapons to resist Assad. And leading Arab states appear increasingly committed to providing those weapons. The only ones who seem overly concerned about a militarization of the conflict are the United States and some of our allies. The time has come to ask a different question: Who do we want to win in Syria—our friends or our enemies? There are always plenty of reasons not to do something, and we can list them clearly in the case of Syria. We know the opposition is divided. We know the armed resistance inside the country lacks cohesion or command and control. We know that some elements of the opposition may sympathize with violent extremist ideologies or harbor dark thoughts of sectarian revenge. We know that many of Syria’s immediate neighbors remain cautious about taking overly provocative actions that could undermine Assad. And we know the American people are weary of conflict—justifiably so—and would rather focus on domestic problems. These are realities, but while we are compelled to acknowledge them, we are not condemned to accept them forever. With resolve, principled leadership, and wise policy, we can shape better realities. That is what the Syrian people have done. 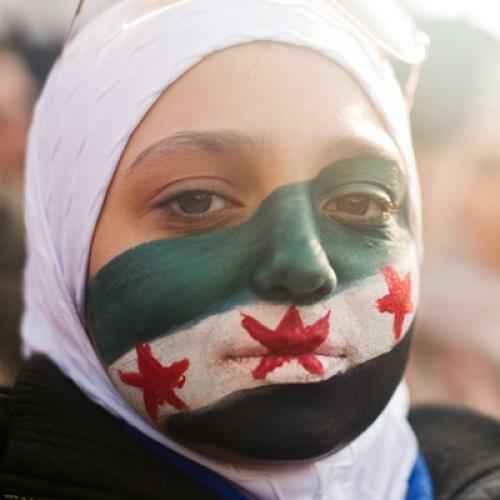 By no rational calculation should this uprising against Assad still be going on. The Syrian people are outmatched. They are outgunned. They are lacking for food, and water, and other basic needs. They are confronting a regime whose disregard for human dignity and capacity for sheer savagery is limitless. For an entire year, the Syrian people have faced death, and those unspeakable things worse than death, and still they have not given up. Still they take to the streets to protest peacefully for justice. Still they carry on their fight. And they do so on behalf of many of the same universal values we share, and many of the same interests as well. These people are our allies. They want many of the same things we do. They have expanded the boundaries of what everyone thought was possible in Syria. They have earned our respect, and now they need our support to finish what they started. The Syrian people deserve to succeed, and shame on us if we fail to help them. John McCain is a Republican Senator from Arizona. This text is a speech he delivered on the Senate floor and agreed to publish as a TNR article.